We have the right Furnished Beach Property for you; read on! We are a Husband and Wife Team: We fell in love with Carpinteria on weekly vacations decades ago. All who visit Carp fall in love with the town, the beach and especially our property and grounds. We visit Carp Beach often and usually become friends with many of our guests that stay with us year after year. The Beach Town is amazing, it's known as the safest Beach in California, the weather is always the best. Sunset Magazine's Best Beach for Vacations in California. Listed as World's Safest Beach. Rincon, top surfing location 2 miles south. Spacious property, and spacious grounds for a beach property. Large open pool area with multiple patio tables and umbrellas. Grass courtyard with a sand shower and friendly people. Solid Slab Walls with deep white tub with shampoo niche. Extended bowl toilet. Ocean view from front of property, but not from unit itself.. 50 yds to the beach from the front of the property. Limited, first come first serve. All pots and pans, dishes and silverware are supplied.. Coffee Pots, toasters, fully supplied kitchen with all utensils necessary for your stay..
Local restaurants are very accomodating, everything is walking close. Upper deck with chairs and cocktail table. Courtyard with table and chairs and umbrellas. Grass Courtyard, large enclosed pool, trolley stop, AMTRAK 250 yards, Antique shops, Restaurants, Stores walking distance. Park your car and walk everywhere if that is your desire.. The entire town is reachable by walking of taking the trolley. The beach entrance is 50 yards from the front of the property. The Pool area is spacious, but protected from the afternoon beach breeze. 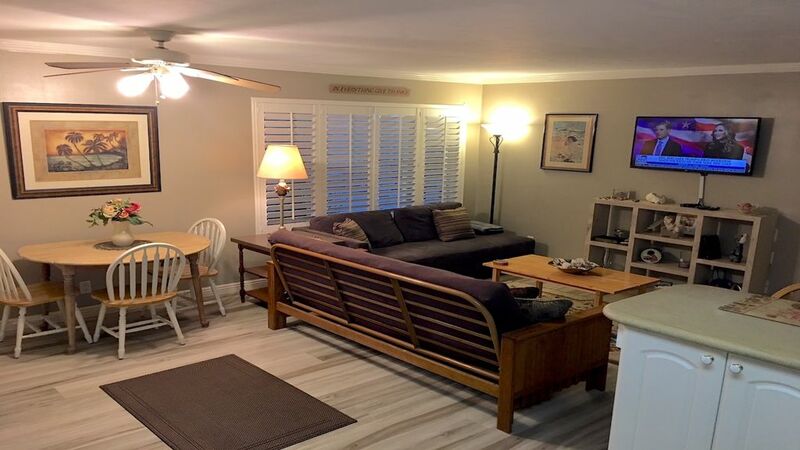 The Tropical setting is part of the ambiance of this unique property..
La Cabana is a great, family friendly destination in beautiful Carpinteria, CA. I have been renting this unit for over 10 years every July with my two daughters and creat their "favorite vacation" memories. The unit is clean and bright. The owners are responsive and kind hearted. I highly recommend this unit! We absolutely love it when returning guests as well as new guests to our property enjoy their stays. We work hard to maintain clean updated properties that are comfortable for summer or winter short or extended stays. It's our joy to not only share our properties with others but to share experiences as many become our friends that stay with us. What a blessing the Carpinteria Beach Community is. We revisit Carpinteria and La Cabana after 35 years. One of my grown sons, his two children and I stayed in unit 7 in La Cabana. This is a studio apartment. It is as pictured on the website except for slightly different furniture in the living room. The kitchen is exactly as pictured and quite generous in size. There is a good sized bathroom and dressing area. Although we might have preferred a larger unit, this was available on short notice and was adequate for the four of us. The owners were enjoying a stay at La Cabana while we were there. They are friendly and helpful. There are some benefits specific to the unit we occupied: It is close enough to the club house that we could access the wi-fi. It is close to the pool from which you can also access wi-fi while the kids swim. It is close to the barbeque which resides in a patio right outside the unit and beside the pool. There are picnic tables where we ate most meals. We have nearby family who visited and we used the patio as an extension of the unit. I don't know if the occupancy was low, but we had the entire patio to ourselves most of the time. It was very quiet in the mornings and evenings with only the sound of kids enjoying the pool in the afternoon. When we stayed here and in another property years ago, it was very noisy even on non-holiday weeks. Maybe we were just lucky in that respect. Our aim was to recreate "vacations past". This involved eating at "The Spot", "The Palms" and "Tony's Pizza". Also important was putting coins on the train tracks and coming back later to find the pennies flattened by Amtrack. Who knew this would be such a memorable vacation feature? The beach was great, as always. If I half-close my eyes I can still see outlines of of the past in various buildings and beach houses. Things have changed, but Carpinteria is still a great place for a family vacation. The unit was clean, well maintained, very easy walking distance to beach and everything else. I would recommend this property to a friend or relative. Just a small note about a previous review where someone complained about the lack of light: The inside of our unit was adequately lit, but not what you would call "light filled" by the morning sun, or whatever the real estate adds talk about. To me this was a relief from the bright outside light and seemed cool and refreshing. Also the grandchildren slept in a bit in the morning - always good! We are always thrilled when our guests take the time out to review their stay in one of our properties. We value all responses, written of otherwise as we are always trying to improve the comfort of each beach unit. We are hand's on owners and also enjoy the property on and off throughout the year and usually get to know our guests over time. We like to be available in case there are some unanswered questions or special needs at the beginning of each stay. These guests have a special place in their hearts for our town as we do and it was a pleasure to help them enjoy that experience once again. Most of our guests return to us in the future and when they do we know what we did to accomodate their stay was well done. My family and I stayed here last summer for the first time and thoroughly enjoyed every minute! The rooms were cozy and comfortable (we stayed in the 2-room unit!). All amenities were excellent and the pool was wonderful! The condo is nearby everything from restaurants, to shops, to the beach! Carpinteria is a lovely town and is great for families! Additionally, the property was very well cleaned and maintained! The owners were so kind and recommended places to eat and things to see! Beach activities, shopping, and good eating were all plentiful. The photos on the website capture just what you will expect upon your stay! We will definitely be back! Our family has stayed in the ground floor one bedroom and second floor one bedroom. Both times our experience was wonderful. The location can't be beat and it's great for little kids. The owners are friendly and professional. We'll be back! My wife and I spent several days in the one bedroom condo in May. On the plus side, a very nice beach is a short walk away and the location is in a nice quiet part of Carpinteria. The town of Carpinteria is a great vacation destination. The condo itself, however, has issues. It is very dark inside with few windows and absolutely no view. The installed lightbulbs are of such low wattage that reading is tough. The floor seal is failing in the kitchen area resulting in exposed concrete and creating a large bubble that if stepped on would crack away revealing additional concrete. Inattention between guests resulted in us finding dirty dishes and pots and pans being put away in the cabinets. Partially used soap and shampoo were left in the bathroom. Not a feeling of being a clean place. Furnace operation is a mystery with no instructions available for the late night arrival. All in all a disappointment compared to other VRBO facilities where we have stayed. We are delighted when our guests respond to our property, even if it means we need to improve in some way.. All of our units within this complex are slightly different. Some have a mountain view, most have courtyard views with lots of light. This unit is in a quiet ground floor area with tropical plants, a window in the bedroom overlooking the street and a picture window in the living area overlooking the courtyard.. When made aware of a heater that wasn't operational, we asked for permission to enter the unit and simply opened the lower door and turned it on.. Working perfectly and turned on for the tenant within an hour and half of notification. We now have placed an instruction on the heater itself. Good advice. The other issues are either being attended to with our cleaning/maintenence crews or are still a mystery.. In interviewing our cleaning crew, they found a note of Thanks and Appreciation, from our guests saying they enjoyed thier stay. I have personally contacted the tenant via cell phone and apologized for any inconvenience and thanked them for their input and let them know we valued their patronage. We are better for it when our tenants communicate openly. As always we appreciate the input and take comments very seriously and have many of our units occupied by the same tenants over and over again..
We look forward to achieving excellence at the Beach for our valued guests and their families. We love our town and our property and are proud of our reputation as dedicated and concerned proprietors of all of our properties..
Seal watching sanctuary, bird watching, tide pool investigating, Salt Marsh trail with explanation plaques... Orchid Capital of the World, flower growers paradise. World famous for Avocado growers. SEE OTHER UNITS WE MAY HAVE AVAILABLE ON: VRBO 184351, Vacation Rental 7051682, Home Away 900311 Contact Owner for specials and if you need more room our HomeAway listings may have just what you need.. Add 12% bed tax under 31 days, from $150-$250 cleaning fee, $500 min. security refundable deposit.. Refunds avail with 60 days notice, 50% Refund up to 45 days notice, other conditions apply. We make every effort to re-rent the property in order to refund less normal reservation fees.